Willow is a sweet little Nigerian Dwarf doe who was born on our farm in 2017. Willow was part of a set of twins. Her brother, Huckleberry, looks a lot like her. Her mom is Primrose and her sire is Prince. Willow has always been a very sweet little doe. She has a wonderful personality, and we often take her to various local events. Physically, she has turned out a lot like her mom: very short and pear-shaped! Although her dad was polled, both Willow and her brother have horns. 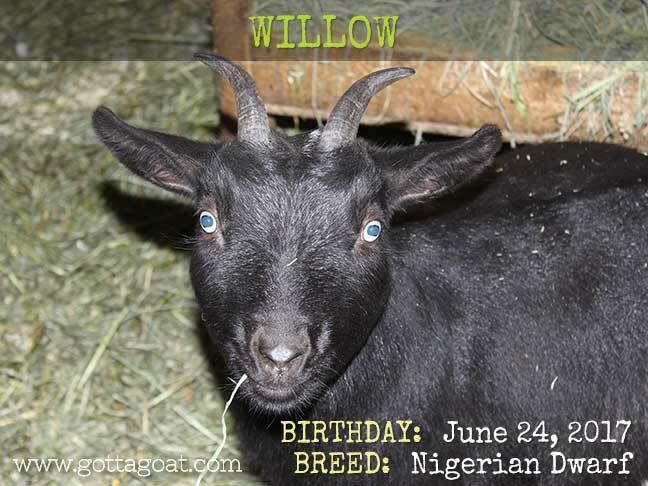 Willow is almost all black with blue eyes, and is an unregistered Nigerian Dwarf doe.